Peterborough United caretaker-manager Grant McCann is predicting a high-class game of football with in-form Walsall at the ABAX Stadium tomorrow (September 19). 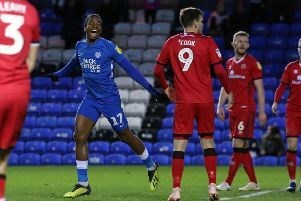 Posh go into the match against the team currently second in League One full of confidence after their own 5-1 win at Oldham last weekend (September 12). Posh midfielder Michael Bostwick is back in the squad to face Walsall. Photo: Joe Dent/theposh. McCann accepts it will be a tougher game for Posh tomorrow, but he is still expecting a positive result and a positive performance from his players. Midfielder Michael Bostwick could return to the side in place of Chris Forrester tomorrow after serving a one-match ban, but left-back Kgosi Ntlhe has now been ruled out for the next two months after an operation on a broken toe. Posh are trying to extend the loan of Leicester left-back Callum Elder. McCann said: “Walsall play good football and that could actually suit us. We will play a passing game as that’s the only way I know and it should be a very attractive game of football. Walsall have good players, but so do we. Walsall have a good goal-scorer in Tom Bradshaw, but they also have some excellent flair players as we do. “It will be a tough game as Walsall are obviously flying, but we will go into the game full of confidence after last weekend’s result. I know people are saying it was ‘only’ Oldham, but they had lost just once all season before we went there so that result should not be under-estimated. “It is in the past now though. I haven’t mentioned it since Tuesday as we’ve been fully focused on getting a good result against Walsall. “The players have been made well aware that they shouldn’t assume they are playing tomorrow just because they were part of a 5-1 away win. There will be no resting on our laurels because we want to string performances and results together. That’s the only way we can get to where we want to be. “We showed last weekend that we can be as strong as anyone on our day, but we need to show that form on a regular basis. Another win under McCann’s care could see the former Northern Ireland and Posh midfielder handed an extended stay as manager. Posh chairman Darragh MacAnthony claims to have whittled the short-list to replace Dave Robertson down to two candidates, but he also hinted that he might delay a final decision while Posh are winning games. MacAnthony also stated that he would make the continued employment of McCann in a coaching role an essential condition for a new first-team boss. McCann added: “As far as I’m concerned my position hasn’t changed from last week. I’ve been asked to prepare the first team and that’s what I’ve been doing. “We’ve worked the players hard this week. We’ve done plenty of running because the players need to be fit to play the way I want them to play. I want them in peak condition for tomorrow. “Michael Bostwick will be in the squad. His season hasn’t kicked off as well as he would have liked so far this season, but he’s a top player and a great addition to the matchday squad. “It’s a shame for Kgosi who had a bit of a setback this week, but he is a lad with a positive attitude so he will come back strongly. Walsall are unbeaten away from home in League One this season.